Engineered with a contoured and snug-fit hand compartment with locked-thumb design for optimal fist closure and to minimize eyes and thumb injuries. 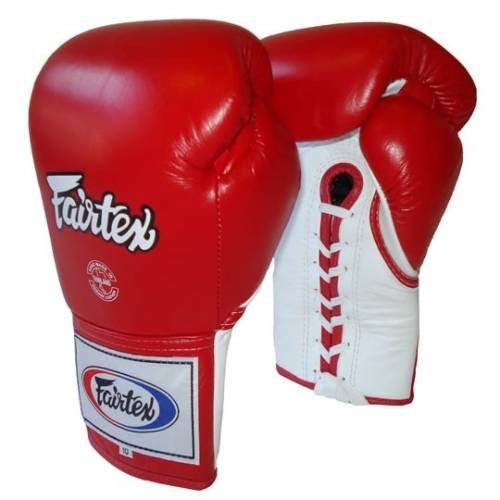 Constructed of premium quality leather with Fairtex original pre-curved triple-layered foam core system at the knuckle hitting area for toe-to-toe actions. Competition Gloves used in K-1 USA, K-1 Brazil, K-1 GP, ISKA, Strike Force, WBC Muay Thai and other championship fights around the world and as seen on ESPN, Pay-per-View, Canal+, Sky Sports, Eurosports, Star Sports, Super Sports, Fox Sports, Fuji TV and other TV networks worldwide.